It is said that there are no strangers in New York because everyone comes from somewhere else. There is truth in this aphorism for Naomi Kuo and Fina Yeung, two artists with different paths to New York who met and discovered their works shared common concerns. Born and raised in Houston, Texas, Naomi moved to Queens in 2013 after college and started an artist residency in New York. Fina, who recently participated in Bushwick Open Studios, travelled even further, first from her hometown Hong Kong to the Pacific island of Guam in the 1990s, before settling down in New York three years ago. 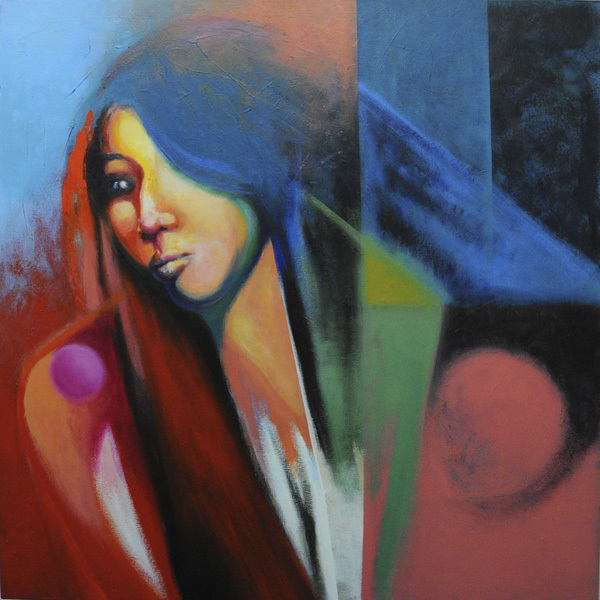 Identity, home, and sense of belonging are themes that both artists explore on a regular basis. In their current exhibition at All Things Project, a gallery within the Neighborhood Church of Greenwich Village that supports cutting-edge visual practices, Naomi’s mixed media paintings are juxtaposed with Fina’s black and white photography. Together, they explore personal and historical narratives. 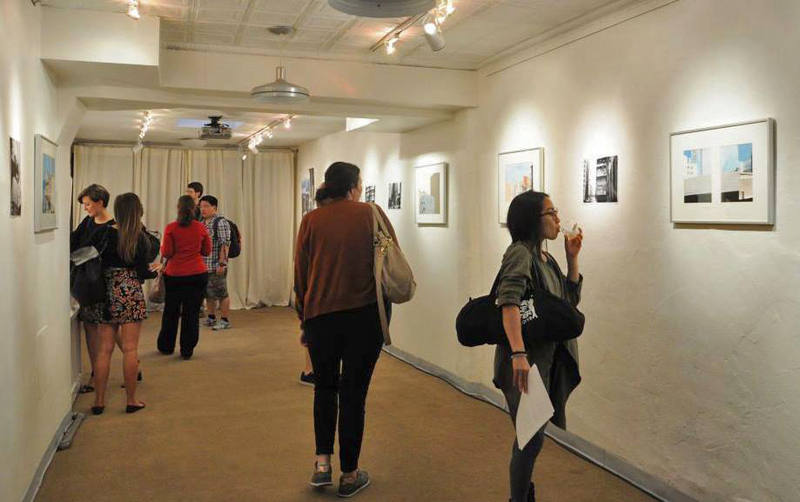 As the exhibition title Building Stories suggests, through images of buildings –– from Naomi’s sensitive renderings of architectures in Astoria and Long Island City neighborhoods to a photographic documentation of crowded Hong Kong cityscapes through Fina’s lens –– their psychological and physical migration stories are revealed. Ahead of their upcoming artist talk at ATP gallery this Friday, June 12, Naomi and Fina generously shared with us personal stories of their artistic journeys. Beyond Chinatown (BC): What brought you two together as collaborating artists and made you decide to have this two-woman show to juxtapose your works? Naomi: The way that artists meet is serendipitous, especially in the city. I met Fina at an Asian American Arts Alliance meeting where I knew nobody! I was drawn to the work she presented dealing with the experience of immigrant women in America. Even though I was born in America, I am interested in exploring Asian American identity, which is tied to the immigrant experience. So I think on the level of things we care about, we’re on a similar wavelength. It wasn’t until we got to hang out and see more of each other’s work that we saw the common theme of architecture. My friends and I at our artist group all thought her architectural photography was very strong – and at that point, my work was just solidifying into its current state in this series, so I believe our friend Adam suggested us showing together before I thought of it. BC: It seems that ideas of home and urban environments are major concerns in both of your artistic creation. Can you talk a little bit more about the themes –––for example, why they are important to you and how have your life experiences affected them? Naomi: I think every life story has a few major arcs that give shape to what one is aiming for in life and what one’s trajectory is. One of my major arcs is belonging – it’s haunted me from childhood dynamics with friends to moving around for school and work, and now thinking about ties to family and heritage. It’s driven me to ambitions and even prompted my move towards faith. So I think the combination of being solitary and pensive, which is born out of that story arc, puts me in a position to notice with more attention what is around me, particularly the non-human elements that shape our experiences and interactions. In a way, my move from Texas to New York was for me a move from suburban alienation to a different kind of urban alienation and yet connection. My art is part of my effort to forge more understanding and connection with people and place. Fina: After my trip back to Hong Kong in 2013, I started working on the theme about the idea of living space as urban cage and our choices of finding a home in cities. I grew up in a very tiny apartment in Hong Kong, where physical space is scarce. So, my emotional relationship with space and home is tied to my birthplace, Hong Kong. Back in the old days, many families would creatively extend living space by building metal cages, hung outside the original building walls of their apartments. Before they became illegal some years ago, one can find these cages of different forms and sizes everywhere. These extra spaces were not uniform, thus creating unique and variable scenes in the city. I think my memory of seeing and observing these interesting architectural forms have helped develop my artistic search in photography and painting. BC: What are your next projects? 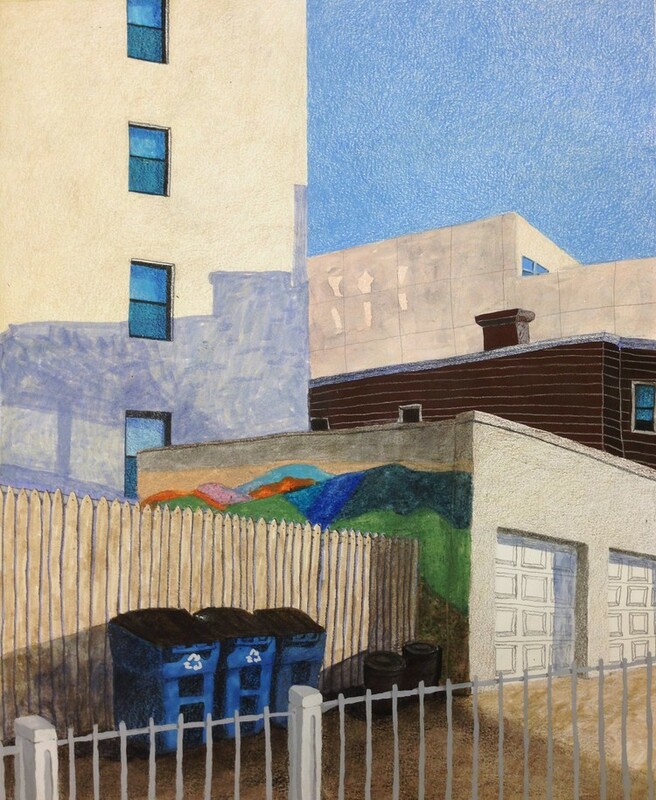 Naomi: I plan on continuing the series, collecting more images from sub-urban Queens and Chinatowns, and stretching and strengthening my drawing and painting. I hope that as I gain more insight and fluency in depicting neighborhood identity, I can even touch on other pressing issues that surround urban neighborhoods today. Fina: My next project is to explore the idea of home and the issue of living space of migrant women who live in New York City. I want to use the mixed media of photography, painting and personal interviews to express the contemporary womanhood and the reality of urban living, its excitement and discontent. BC: Fina, almost all the photos in this show are black and white, which is very different from your colorful paintings. Why do you choose to use black and white to portray a city like Hong Kong? And can you also compare these photos with your “Hong Kong Revisited” installation? Fina: I first exhibited these black and white photos alongside my installation work entitled “Hong Kong Revisited” during Bushwick Open Studios last year. 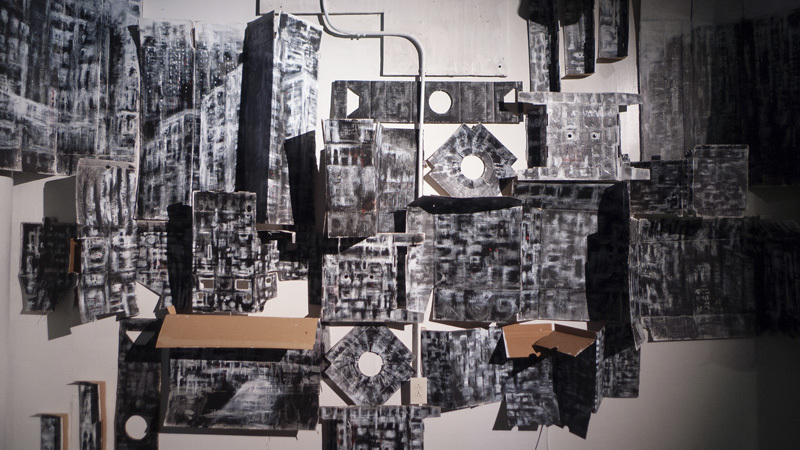 It was a monotone installation built from 30 pieces of corrugated cardboard, painted and arranged on the walls. Both the monotone painting and photos intended to submit our visions to the haunting darkness in cage-like place like Hong Kong. The black and white photos retell stories about a city where physical space is scarce, and where new skyscrapers and old residential buildings stand side-by-side. Although old buildings are repainted and remodeled constantly, the traces of history of the overcrowded urban living can still be seen on the external walls of many buildings. With these photographs, I create not only a personal story, but also an emotional experience for those who try to find beauty in the dark side of a glamorous city. BC: Now you are living in NYC after spending many years in Hong Kong. How would you describe the connection between these two metropolises and the inspiration you have from such connections? Fina: Both cities are culturally diverse, glamorous and depressing at the same time. Hong Kong is well known for being overpopulated city with expensive housing market. While there are multi-million dollar high-rise apartments, some low-income people are living in nicknamed “coffin home” or cage-like home, which is only big enough to fit a person and few belongings. I left Hong Kong many years ago and I have reconnected my feeling of urban living since I moved to New York City to pursue my goal being an artist in an artist community. When I started looking for a place to live, I noticed that it was not easy to rent a place that was right for my budget and my needs. 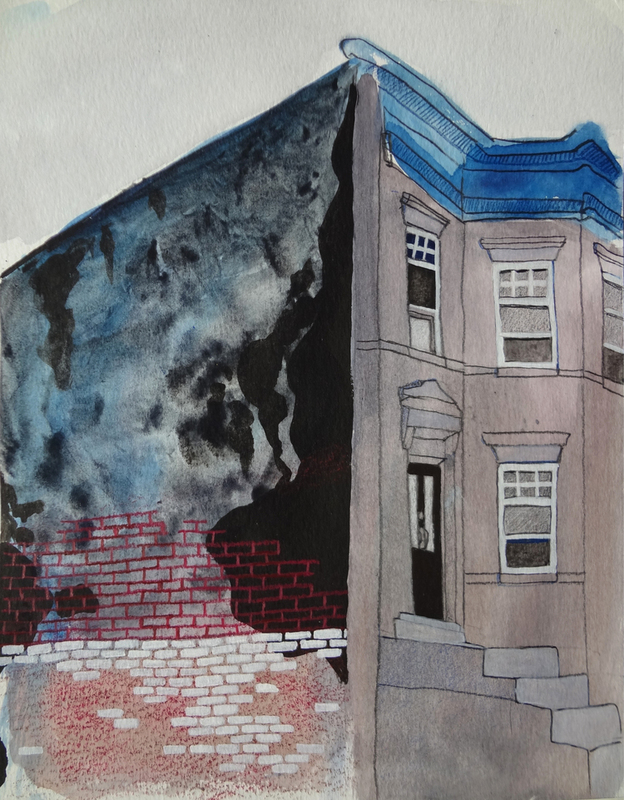 So my experience of searching for living space in New York City ignited my desire to understand the complex experience living in a city where housing and space is a major problem. This is not only about my journey, but also other people, especially women, whose stories about finding home in New York while away from their home countries. BC: In your online portfolio, there is a self-portrait series as well as a very interesting commissioned portraits series. Did you start the self-portraits first? What’s the process of your self-exploration through this series, and how do you apply such explorations on your commissioned portraits for other people? Fina: Actually, I started making portraits of other people first. To me, making a self-portrait indicates self-confidence, and I did not have that. However, I am always fond of creating portraits of others with both photography and painting. By creating expressions for other people in portrait, I engage myself in making stories of others and it helps reflect my own emotion. There was a long period of time I did not know how to accept myself as an artist and probably being an immigrant sometimes has confusion. Until I moved to New York City, the increasing artistic activities and experience have helped me grow a better artist. I started to examine my identity as a woman artist in western society by creating first a series of self-portraits. The series entitled “Emerging Self” is my confrontation to my emotion and my determination of self acceptance. Therefore, this emotional process of self-exploration is an important healing journey of finding self and creating new energy for both portraits of self and others. 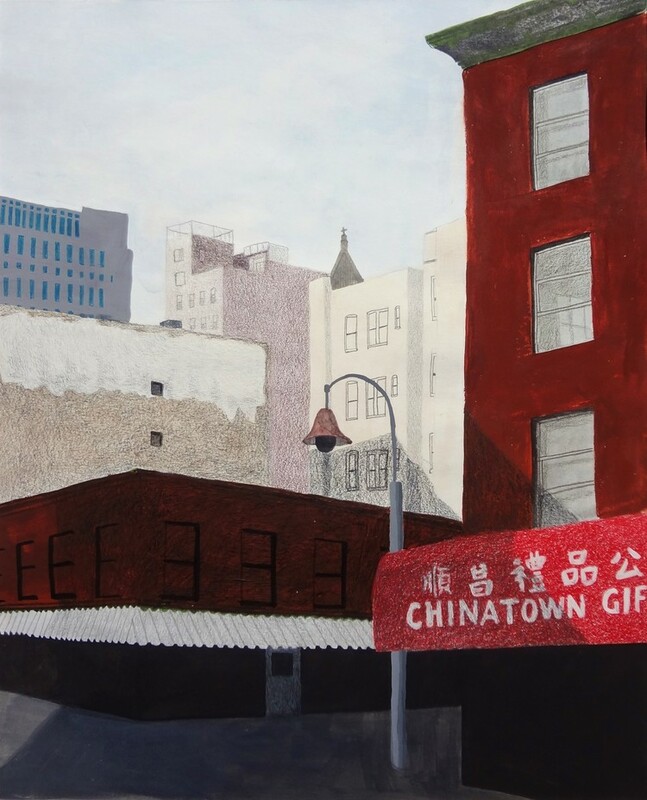 BC: Naomi, your mixed media paintings really depict New York City in an unusual way –– Long Island City and Astoria are not typical places to portray. In your work, the architectural details and streets in these places seem to be solitary. How is the idea of urban transformation reflected in these seemingly quiet neighborhoods? Naomi: Well, New York City has its hip spots where young people like to play and then its places where they resign to live – although I think most people end up loving these secondary living places, especially in Astoria and Long Island City. To my understanding, Astoria is feeling the changes that come with the influx of young urban professionals in a less tense way than some areas in Brooklyn, for example. I start in Astoria and LIC, though, because that is where I live and work, and I think the advantage of a work of art over, say, a sociological essay, is getting to lean in to the personal perspective — and besides, these neighborhoods do have a unique hodge-podge look. These kinds of changes are definitely on people’s radars, but in different ways depending on who you are and how you’re affected. I’m interested in the places where people live and the tension between what is “glamorous” and what is not, and the physical changes that sneak in, in the meantime. So while my deletion of some street-level details, like cars and people, accentuate quietness and the solitary feeling, it’s also true that the fields of contested urban transformation often are outside of the limelight, and that the rate of change is just a bit slower, taking longer than an individual’s lung capacity to make a continuous noise about it. BC: Houston must be so different from New York City. How would you describe your emotional and physical migrations from the American South to New York City? Naomi: Houston is actually similar to New York City in many ways. They’re both very ethnically diverse and quite big – not exactly places where you would expect to give and receive warm hellos to everyone you walk by. The biggest change was just coming out of college and into more independence as an adult and an artist – so that has less to do with place than life stage. That’s what I would describe as my emotional migration – a kind of roaming need for depth and solidity that I think would be present even if I did not move, but that has certainly been more highlighted for me as I’ve had to uproot from the people and places that I’ve been around my whole life. But as far as differences go, the population density and the rubbing of shoulders with so many people every day new experiences. New York City is an older city with more of an urban history. The Asian American population seems to have sprouted in Houston in the last twenty or so years, but in New York City, you have people whose families have lived here for generations, stretching back to darker times in the history of Asian immigration to America. There are clearer delineations of neighborhoods and stereotypical markers of identity that I think are important for me to learn more about as I have taken for granted or glossed over the larger Asian American story, having grown up mostly surrounded by other Asians in an unconscious way. So my “migration” to NY has connected me with the migrations of others like me, which helps me relate to the movements of other people groups too. BC: Your recent artist residency is part of a faith based non profit organization. Can you talk about the interaction between your faith and your artistic creation? Naomi: Transform, the artist residency I am in, exists in the context of a larger faith based non-profit organization because there are people who recognize and care about the fact that it’s difficult to flourish as both an artist and a person of orthodox faith. There are parts of our current culture that hold religion and institutions suspect, and people with different worldviews tend to assume things about each other, cutting off potential meaningful dialogue. This is especially true for Christianity in America today. And so that a Christian organization is working to support people who want to pursue art professionally in non-religious settings, I think, is an important step towards open and respectful dialogue between sometimes mutually exclusive parts of society. More personally, however, I think it’s hard for faith to survive through just the normal assault of busyness, stress and uncertainty of figuring out one’s career, finding new friends, trying to make money, etc. You can easily lose your sense of purpose and morale. While I don’t feel the need to make art that directly depicts my faith, my faith leads me to empathy and compassion for people from all walks of life, and to desire the renewal of the city towards holistic well-being, which lead me to the subjects for my art. For that reason, I’m thankful for this artist residency and other communities of people that I’ve found that help me keep first things first and help me trust that the other things that I seek will flow out of that. Building Stories continues at ATP Gallery until June 27 with an artist talk on Friday, June 12 at 8pm at the gallery.